Does goodness have an unconquerable strength to itself? Can love conquer death? 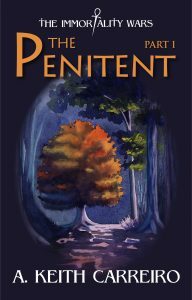 In this first segment of a three–part, speculative fiction thriller, titled The Penitent – Part One, an allegory seemingly right out of the Middle Ages explodes into being. Yet ironically, it remains a futuristic tale whose story unfolds as a 26th century epic. Pall Warren is a warrior who is the sole survivor of an elite unit whose vanguard was sent against a coalition of raiders invading his country in a large scale, hit and run attack. Wounded by a strike to his head, he begins a quest to regain the knowledge of his past and who he really is in life. He gradually begins to regain this information in a variety of flashbacks and experiences that he encounters throughout the remainder of the story. At the inception in his journey of self–discovery away from the battlefield while he is recovering from his wounds, he encounters John Savage, a mysterious bowman who almost kills Pall when they first meet one another at a stream. Savage yields to caution and to his better nature; and the two men become brief, yet uneasy, companions as they seek refuge in a nearby and abandoned farmstead. However, instead of finding solace and rest there, another battle takes place, first against a band of marauders led by Gregor Mordant, and then against a demonic force called Ünger. Two warriors are now set on a quest to discover the truth behind war and evil breaking out in their land. Pall discovers that his world, while filled with unfathomable beauty, seethes with an opposing force of repulsion against it. A cautionary story of the future, a legend unfolds around these two medieval warriors. While one experiences a grueling quest for meaning, the other launches on a hunt for a wily opponent. In Pall’s odyssey towards self–revelation, he learns that evil must be fought against by every generation. In his search for Savage, Pall must come to terms with what he can do; what he can hope for and what he can achieve in this life. Set in the past, cast in the future, comes a cautionary tale of humanity’s presence in the universe.